When the last rays of sunlight give way to the starry sky, you never know who may be hiding in the shadows. A good outdoor lighting installation has proven time and time again to be the best solution for keeping the numerous burglars in London away from any home or office. With a properly installed lighting security system, the bright artificial light will efficiently disperse the darkness surrounding your property and will have a comforting effect on both you and your visitors. Security lighting comes in many shapes and forms. For example, the precise and skilled technicians can equip your front door with a complicated motion sensor light installation or a thermal system that reacts to body heat. If you wish to drive the shadows away from your home's entire perimeter, the specialists will gladly assist you by installing powerful floodlights. 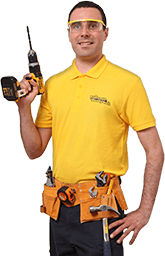 The knowledgeable handymen can even provide you with battery-operated and wireless security lights, as well as with special lighting that will automatically turn on as soon as it grows dark! As you can see, there are many ways in which you can improve your home's security. And Fantastic Handyman is always ready and willing to help you set-up your home security lighting in a way that will meet both your personal needs and those of your property. But why should you rely on a practised security lights fitting company to do all the heavy lifting for you? Almost any security lighting installation, no matter how simple or complicated, is connected to the power grid. When you wish to install or maintain an electric light fittings system, you should always hire licensed and reliable professionals for your electrical repairs. Any unqualified work can potentially damage your lighting and/or invalidate its warranty. While there are many things in life that could be considered a child's play, fitting security lights definitely does not rank among them. If you decide to go full on DIY mode, you really need to know what you are doing. Otherwise, it's very easy to cut the wrong wire or use an inappropriate tool, creating life-threatening situations, such as lighting your home on fire or receiving an electric shock. How will I benefit from a security lights installation? Each type of security lighting installation is specially designed to clearly illuminate the objects near your property and to discourage thieves from breaking in. With an outdoor motion sensor light in place, you will also no longer have to spend five minutes just to find your front door’s keyhole, making it a pretty convenient addition to your home. Are solar-powered security lights any good? While it is definitely the most eco-friendly solution on the market, solar-powered lighting is also the least powerful. Relying on the sun as their primary energy source, these systems will only be able to illuminate your garden for a few hours before they get engulfed by darkness. In that case, should I opt for halogen lights instead? Just as any flood light installation, halogen lights are designed to glow really bright and are your go-to choice if you wish to see everything around your property in perfect detail. Be advised, however, that such bulbs tend to consume lots of power, so be financially prepared. Then what sort of security lighting should I actually get? Speaking strictly from experience, we believe that LED security lights are the most suitable choice. Not only do they provide enough visibility, but they are also relatively inexpensive and do not require much power to operate. And let’s not forget that LEDs will also last you for a really long time.